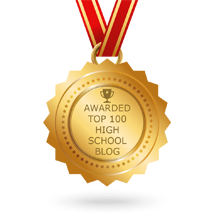 When I first began flipping my math classroom in 2010, the ability to screencast, upload to the web, and have students be able to watch lectures at their own pace was exciting and innovative. Though that was a step in the direction to a more personalized, student-centered classroom, tech tools that have emerged in the past four years have truly revolutionized what is possible. Two of my favorites are Pear Deck and EDpuzzle. 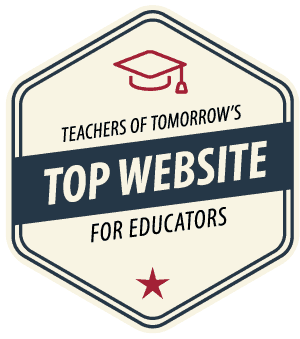 These tools provide rich analytics and insight into individual and class needs. Empowered with this information, I can customize and personalize the learning experience for each student in the classroom. Students typically watch a video for homework so that we can engage in discussion and critical thinking tasks in the classroom. I assign each of my videos through EDpuzzle and embed questions within the video. 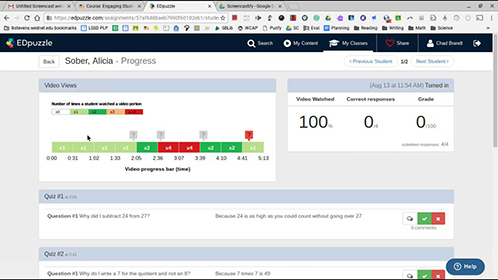 EDpuzzle’s analytics inform—before students even step into the classroom—how I should run class the next day and alert me to individual student needs immediately. I can then design learning tasks customized to the needs of the class, create the most effective student pairings, and identify student-leaders to facilitate peer-to-peer learning. The ability to monitor student-progress is extremely powerful for the teacher. But real-time feedback is just as important for the student. Embedded quizzes give students the opportunity to check their understanding immediately. And short-answer questions can be used to guide the students to make big-picture connections, summarize concepts, or take a reflective pause. Not only does the interactivity engage students, it forces them to think more critically, and understand areas where they need to focus questions. This way, students can make the most effective use of their class time. One of my favorite ways to kick-off classroom discussion is using Pear Deck, a formative assessment tool that allows teachers to ask questions within a presentation and display anonymously the responses of the class on the board. I create a guided activity to ramp students up to thinking about and answering bigger-picture questions. Pear Deck allows me to gauge the tone of the classroom, see where students are making connections, and immediately identify who needs what for the day. To further differentiate and meet individual student needs, I use Pear Deck’s student-paced mode so that students can respond at their own pace. Traditional classroom discussion often pressure students into quickly responding, or may lead to quick assumptions that a student who is responding slowly does not know the information as well as a peer who immediately raises their hand. With Pear Deck’s student-paced mode, students can work through problems at their own pace. I can monitor progress through the dashboard, in real-time, so that I can target individual needs at the same time I am looking at the overall class analytics. This information allows me to move throughout the classroom efficiently and effectively, and sit down with individual students and provide the precise help they need. Students should have the opportunity to respond in a format that is most comfortable for them. While some are naturally more vocal, others thrive when they have a moment to process and type out their thoughts. Pear Deck gives the quiet and quick students and the louder and more methodical students equal voice. After each student has responded, I can project all responses on the board for a group discussion. This dialogue is an important part of my class, but using tools such as Pear Deck allows me to ask the question differently and to get a far better sense of individual needs than I ever could before. 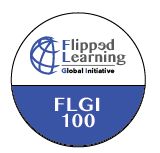 My flipped classroom has evolved and continues to transform as tech tools provide new and exciting ways to get insight into each student’s needs. These tools allow teachers to provide a level of personalization and customization that simply was not possible less than 5 years ago.